My final full day in Chicago found me walking another route through the city. For the first time while I’ve been hear the weather wasn’t scorching and I enjoyed the break from the heat of the sun. As is seemingly standard, I began in Millennium Park and followed Michigan Avenue to the John Hancock Centre catching all the sights along the way. For some reason the street is known as the Magnificent Mile but I think Mediocre Mile might be more applicable. The great architecture aside, there wasn’t really anything to justify the title. It’s like Oxford Street only taller. 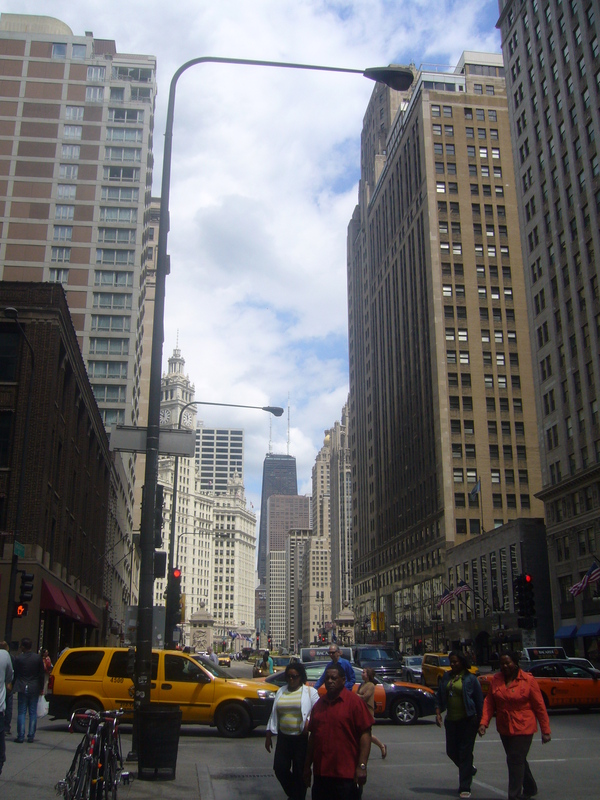 Some of the highlights included the Wrigley Building, home of the Wrigley Corporation. 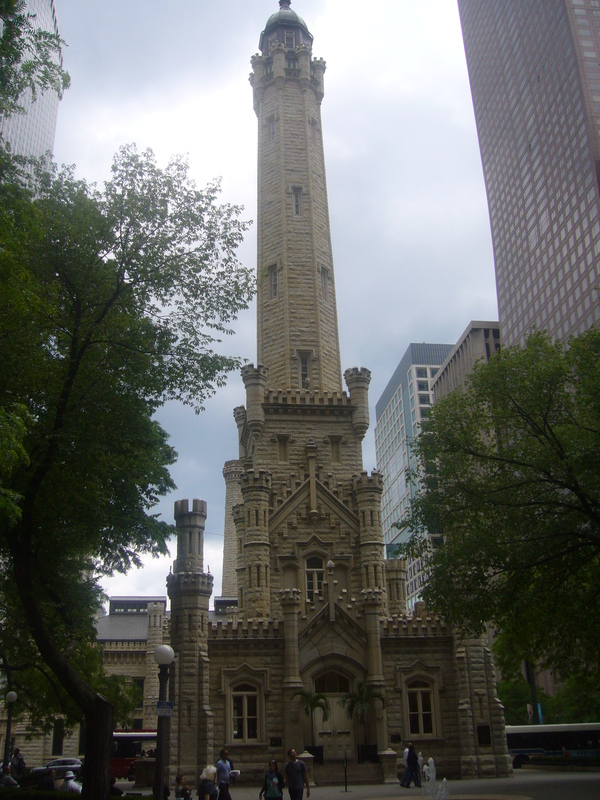 The next thing I came across of any significant interest was the water tower, the only building to survive the fire of Chicago of 1871. The story goes that a cow kicked over a kerosene lamp and burned the city to the ground. 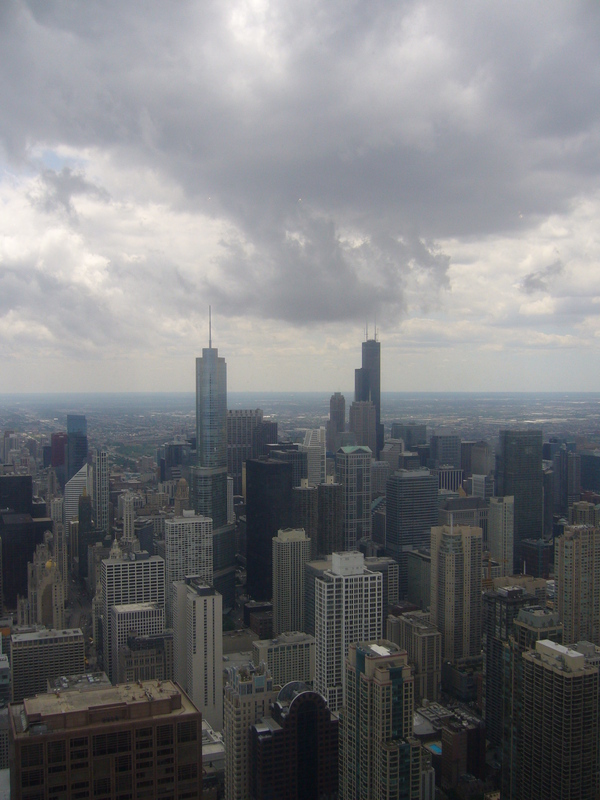 Once I’d done with the Magnificent Mile I hit up the John Hancock Centre which carries the tag line of “More View, Less Queue” and they don’t lie. I walked up to the elevator and had the pleasure of it to myself. Once at the observatory I found that they don’t lie. 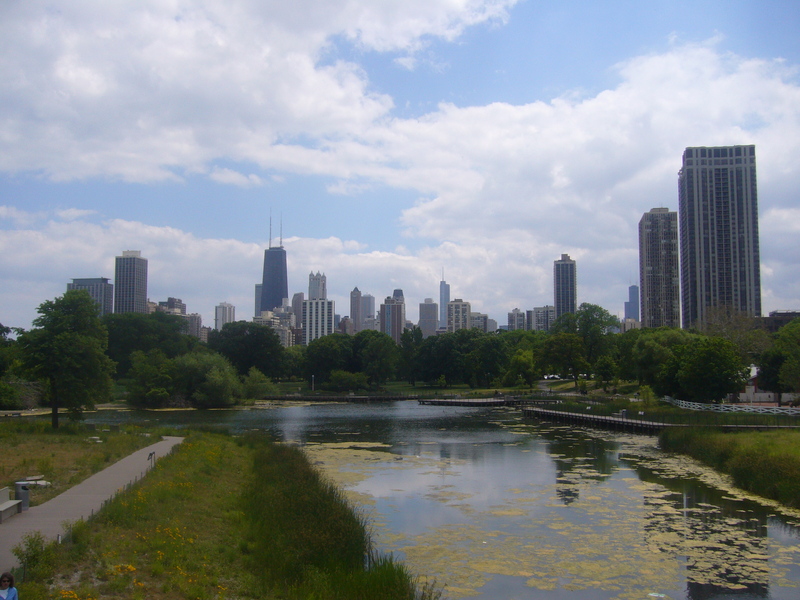 The view is magnificent, from over the lake to back across the city it truly is better value than the Sears/Willis Tower. 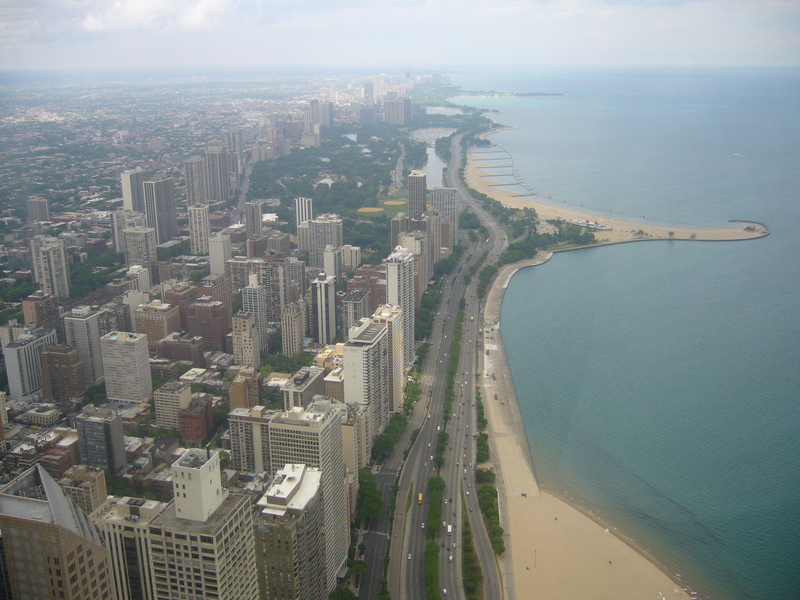 While I was up there I clocked the beach and Lincoln Park. Initially, I had planned to catch the L train from the Hancock Centre north to find what is reputed to be the best vegetarian restaurant in town but seeing how the weather was fair and I had the day to burn I decided to walk along the lake shore and cut through the park. 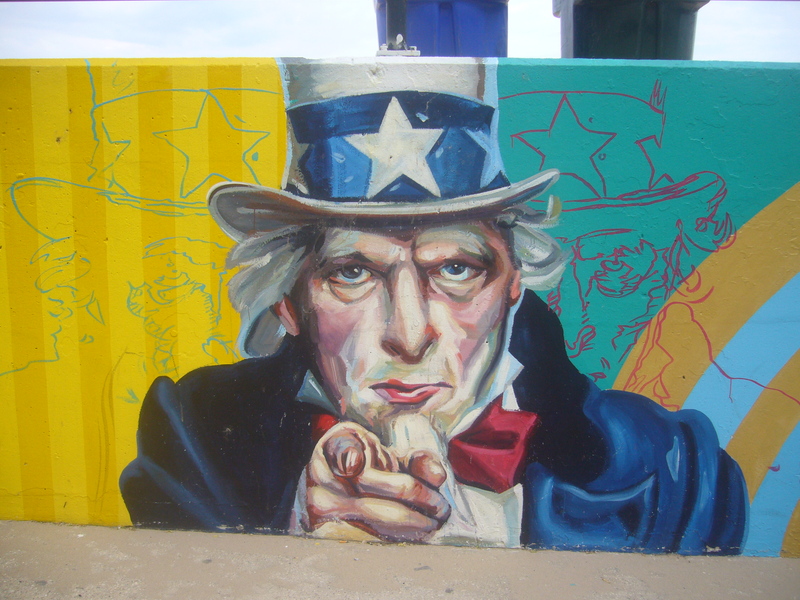 The entrance to the beach was cool and I caught a sight of Uncle Sam. Once on the beach, I found that the sand only lasted a short while before becoming huge slaps of concrete. The lake looked pretty rough and I was convinced that getting in would only end being dashed on said concrete. Unlike in Toronto the waterfront had been utilised pretty well, with what I have to assume are man-made beaches and parklands spread out between the last highway and the water. Eventually I reached a bridge into Lincoln Park and found children playing every sport from football to ultimate frisbee. 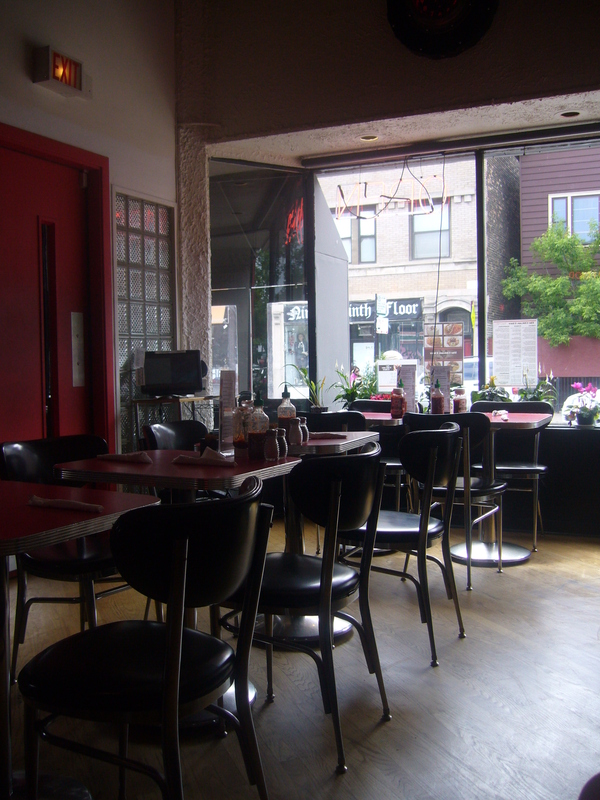 I passed through, catching sight of a few animals in the zoo and finally made my way to the Chicago Diner. I’m kind of getting used to going to restaurants alone and I think I like it. You’re able to focus solely on the food on your plate, and the occasional spot of people watching. When I arrived at the Parthenon Hostel I asked about good vegetarian places to eat and the guy behind the desk spoke highly of the Chicago Diner, but he said it was quite a way out. Once I found my way there, I was amazed by the completely meat-free menu. 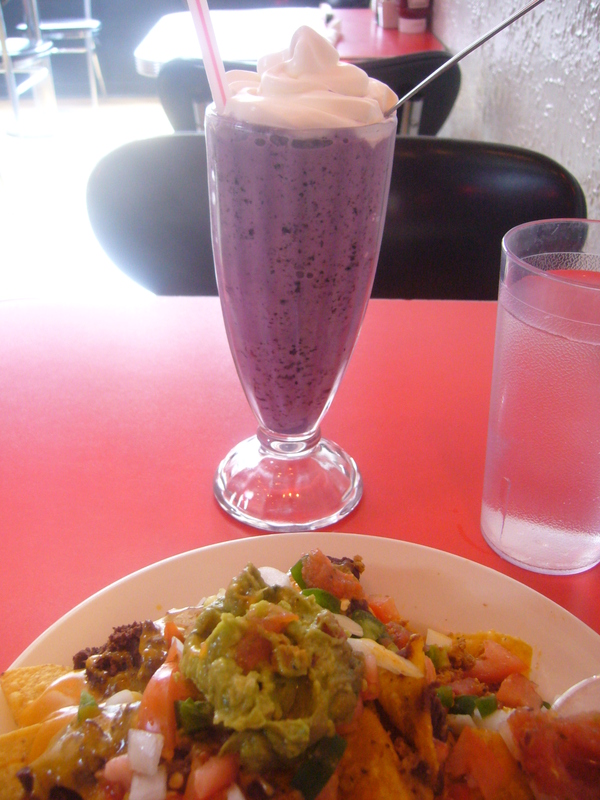 This was ideal and I browsed the menu for some time before settling for nachos. I know this isn’t anything extreme but the promise of seitan chorizo was too much to overlook. Chorizo is just about the only thing I miss about eating meat so any substitute is always worth a punt. I also opted for a blueberry smoothie to wash it down. The restaurant was fairly quiet and I had three staff regularly chatting with me and checking that everything was ok. The nachos were awesome, I was more impressed with the spicy black bean paste than the seitan chorizo which didn’t really taste anything like chorizo. On the other hand, the smoothie was on another level, it tasted a little like parma violets. Once I’d had my fill I decided once again that it was probably worthwhile heading back to the hostel. That night I headed out with my two Irish room-mates Callum and Rich, first to an Irish Bar because you know, you come halfway round the world to check out how they mimic your home. After one round, we had heard rumour of a place that was serving pints of beer for $2 which is an offer far too good to refuse. We walked the streets for a while before entering Spectrum where we found our two Swedish room-mates already well oiled and enjoying the East Finals of the basketball. Once we got in we found that not only were the pints cheap but we could get a pitcher for $10! This night, we knew, was going to be a good one and the drinks started flowing. The bar was open until 4am which, at the time, seemed like a good idea. We drank well into the morning before eventually stumbling back to the hostel, collapsing into bed and hoping that the next day would be kind to us.